Will Walmart Charter School Money Trump Endorsements in Area Six SCOE Race? The Sacramento County Office of Education is one of those governmental agencies that few people understand, much less knows exist. That is changing this election cycle with what has become a high-visibility primary election contest coming next month. In the race to succeed outgoing Area Six SCOE Trustee John Scribner there are four candidates vying for the seat. Those candidates include Heather Davis, Orlando Fuentes, Jrmar Jefferson, and Stephanie Nguyen. The good news for the two Democratic candidates in the race - Fuentes and Nguyen - each recently scored important endorsements. Last week the Elk Grove-South County Democratic Club offered its endorsement to Fuentes while Nguyen has earned the endorsement of the Sacramento Bee Editorial Board. While the endorsements are undoubtedly welcome, the bad news for Fuentes and Nguyen is there is an 800-pound gorilla in the room supporting one of the other candidates that have the backing of one of the world's wealthiest families. 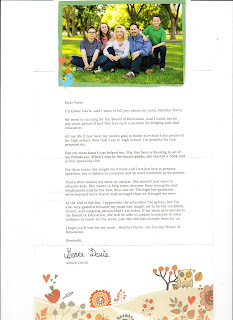 That beneficiary is Elk Grove's Heather Davis, and the money is being spent by the California Charter Schools Association Advocates Independent Expenditure Committee. 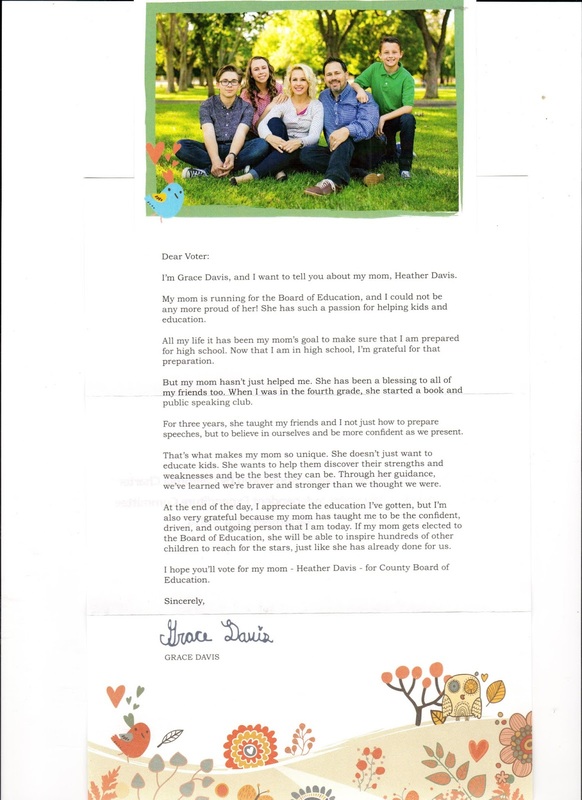 Last week that independent expenditure committee send out a mailer (see below) addressed to registered voters ostensibly penned by Davis' juvenile daughter. Additionally, Davis' campaign committee sent out a glossy bullet point mailer last week (see above). To date, none of Davis' opponents have to our knowledge have sent out slick mailers or even placed campaign lawn signs. Not surprisingly, Davis' husband Elk Grove Mayor Gary Davis is employed by the California Charter School Association as the Director of Board Engagement and Leadership Development. Interestingly over the last several years Mayor Davis has been unable to get charter school proposals he supported approved by the Elk Grove Unified School District. Major patrons of the California Charter School Association include heirs to the Walmart fortune, Carrie Walton Penner, and Alice Walton. Earlier this year The Walton Family Foundations said it would give $1 billion over the next five years in support of charter schools, although their motivation for this funding has been routinely criticized. So as the June Primary quickly approaches, it will be interesting to see if Davis' Goliath-funded campaign, thanks in part to Walmart backing, will succeed over two David candidates with significant endorsements but by comparison woefully underfunded. The Koch Bros have their hands and money in anti-public school movements with the goal to privatize education - making education a for-profit endeavor. 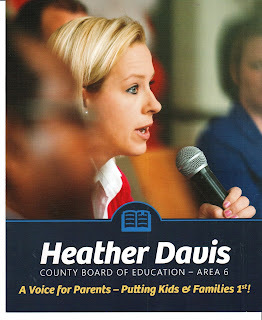 Heather Davis is a bad deal for kids and public education. Not that all charter schools are bad, but their track record is pretty awful. Read Diane Ravitch's books Reign of Error (on school privatization) and The Death and Life of the Great American School System. As those who keep up with politics know, the Koch Bros. have their dirty fingers in all kinds of 'small' local elections, school boards being one of their main targets. Time is running out for the Davis kids to bail out of the pubic schools and enroll in a quasi-private charter school at taxpayers expense. But personally, I'm holding out for Monasky.